US doctors have successfully performed the world's first skull and scalp transplant. The recipient, a former cancer patient, also received a new kidney and pancreas during an operation that lasted more than half a day. James Boysen "is the first patient to receive the simultaneous craniofacial tissue transplant together with solid organ transplants," Houston Methodist Hospital said in a statement. 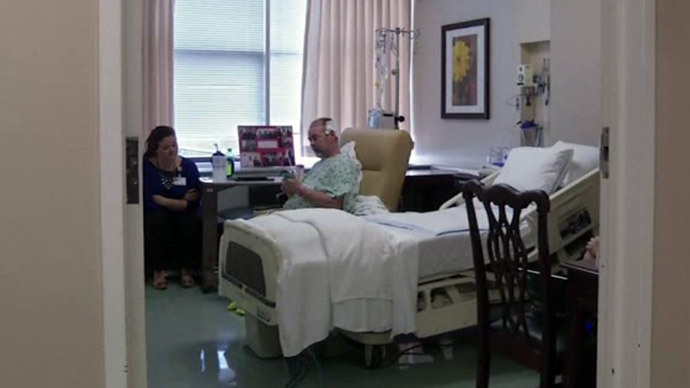 The 55-year-old software developer from Austin, Texas, underwent 15 hours of surgery performed with the help of more than 50 medical professionals, the MD Anderson Cancer Center in Houston said on Thursday. The lead surgeon on the team, Michael Klebuc, said the operation was “very complex” because tissues had to be transplanted through microsurgery. "Imagine connecting blood vessels 1/16 of an inch under a microscope with tiny stitches about half the diameter of a human hair being done with tools that one would use to make a fine Swiss watch," Klebuc said in a statement. Video provided by AP after the surgery showed Boysen with stitches circling the top of his head where the transplanted skull and scalp had been attached. Boysen was diagnosed with leiomyosarcoma – a rare form of cancer that attacks smooth muscle – on his scalp nine years ago. He was successfully treated with surgeries and radiation, which left a large wound on his scalp and skull. A type 1 diabetic since the age of five, Boysen had already had kidney and pancreas transplants, but those organs were failing. Surgeons conducted all the transplants at the same time, from the same donor, because it offered the best chance against organ and tissue rejection. But despite the major surgery and multiple transplants, Boysen says he's feeling great. “I’m amazed at how great I feel and am forever grateful that I have another chance to get back to doing the things I love and be with the people I love,” he said, as quoted by Reuters. He also joked during an AP interview that his new scalp looks better, because he didn't have as much hair before the surgery. He was released from the hospital on Thursday and will spend the next few weeks at a residence for people recovering from transplant surgery. The operation was conceptualized almost four years ago, but wasn't carried out until May 22, approximately 20 hours after doctors learned that suitable organs had become available.